In 2001, member states of the United Nations unanimously adopted the first ever annual day of global ceasefire and non-violence on 21 September – Peace Day. This was through the efforts of an international organisation called Peace One Day which was formed in 1999. Peace One Day organises events throughout the world to promote peace in many forms - ceasefires in wars, support for victims of domestic vioience and bullying, encouraging unity through sporting events, education for life-skills, and health projects. Clare Mellor became aware of events organised by churches (Methodist and others) in Manchester for Peace Day, and was inspired to set up a small working-party of volunteers to devise events to highlight, promote and celebrate this Day in Bury St Edmunds. So the Bury St Edmunds Chain of Hope was born. 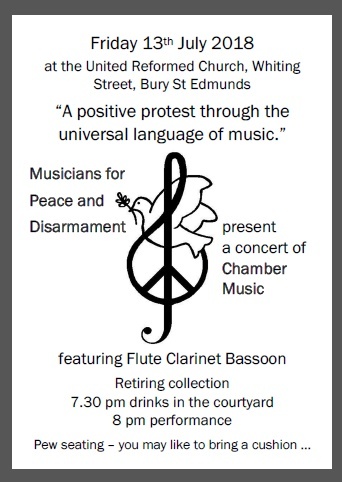 A Concert of Chamber Music on Friday 13th July 2018, in association with Musicians for Peace and Disarmament. "A positive protest through the universal language of music. ", bearing in mind the expected visit to the UK of the US President on that date. The concert will feature Flute, Clarinet, Bassoon. Where? At the United Reformed Church, Whiting Street, Bury St Edmunds. When? Friday 13th July, 7.30pm drinks in the courtyard, 8pm performance.